Coming Back... January 22, 2016! Stop by and share YOUR thoughts on those first line! 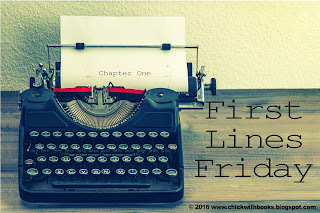 I never knew about this First Lines Friday meme. I will be back this Friday!! Looks as if I missed a few, but at least I know about it now. THANKS. Yes, definitely come back and explore everything! I love sharing the opening lines of the books and seeing how well they stand up on their own! This is a fun idea! Do you still do it?